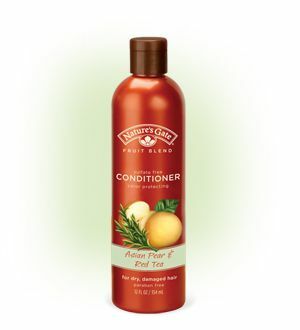 Deeply conditions and moisturizes dry, damaged hair. Organic Hops and Red Ted Extracts, rich in vitamins and amino acids, help replenish lost nutrients, while Panthenol (Vitamin B5) helps smooth split ends and hydrates distressed locks. Our unique blend of Wheat Proteins and patented Sunflower Seed Extract helps repair damage caused by daily UV exposure and protects color treated hair from fading while adding shine. Leaf/Stem Extract*, Lippia Citriodora (Lemon Verbena) Flower/Leaf/Stem Extract*, Cetearyl Alcohol (Vegetable Derived), Behentrimonium Chloride (Vegetable Derived), Glycerin(Vegetable Derived), Aspalathus Linearis (Rooibos) Leaf Extract*, Pyrus Communis (Pear)Fruit Extract*, Helianthus Annuus (Sunflower) Seed Extract, Actinidia Arguta (Kiwi) Fruit Extract*, Prunus Armeniaca (Apricot) Fruit Extract*, Ficus Carica (Fig) Fruit Extract*, Punica Granatum (Pomegranate) Fruit Extract*, Euterpe Oleracea (Acai) Fruit Oil*, Humulus Lupulus (Hops) Flower Extract*, Aloe Barbadensis Leaf Extract*, Centella Asiatica (Gotu Kola) Extract*, Echinacea Angustifolia Extract*, Cymbopogon Schoenanthus (Lemongrass)Extract*, Zingiber Officinale (Ginger) Root Extract*, Panthenol, Bisabolol (Plant Derived), Hydrolyzed Wheat Protein, Hydrolyzed Wheat Starch, Saccharide Isomerate (Plant Derived), Tocopherol (Vitamin E), Simmondsia Chinensis (Jojoba) Seed Oil*, Hydroxyethylcellulose (Plant Derived), Disodium EDTA, Polyquaternium-10 (Plant Derived), Alcohol*, Glyceryl Undecylenate (Vegetable Derived), Phenoxyethanol, Citric Acid (Vegetable Derived), Fragrance**.